Driven by what’s missing in experiments, Brookhaven's Yan Li applies quantum mechanics to compute the physical properties of materials. A summer doing lab experiments as a doctoral student was enough for Yan Li. “I figured out I may be too clumsy to be a lab scientist” and eventually turned to computers, she says. Li now is an assistant computational scientist at Brookhaven National Laboratory on New York’s Long Island, but that doesn’t mean she’s completely forsaken the lab bench. She often collaborates with experimental groups – partnerships that, among other things, study ways to make solar energy cheaper, more efficient and more flexible, whether to produce electricity or clean-burning hydrogen. Li focuses on first-principles electronic structure theory calculations: applying fundamental rules from the strange world of quantum mechanics while forsaking any adjustable parameters to compute the physical properties of materials, whether as molecules, surfaces, crystals or nanometer-sized structures. The calculations are especially demanding because they adhere to quantum mechanical principles, which exact a higher computational cost than classical physics models. With first-principle electronic structure theory, Li and her colleagues decipher the detailed properties of materials at the atomic scale what happens at the interfaces where they meet. Their favorite method: density functional theory (DFT), a generally accurate and reliable approach that takes much less computer time to reach a solution than quantum chemistry techniques. Its balance of accuracy and affordability makes DFT the most popular computational method for research in chemistry, materials science and other disciplines, Li says. But “depending on the particular property you’re interested in, we have to go beyond DFT or combine” it with another method. That’s the case in one recent project to help solve a mystery involving gold nanoparticles, sunlight and hydrogen production. Stony Brook University doctoral candidates Peichuan Shen and Shen Zao, with Alexander Orlov, materials science and engineering professor, study cadmium sulfide, a material that, when exposed to sunlight, mildly acts as a catalyst to produce hydrogen from water. “It’s a standard substrate, not really fancy, but it has some unimpressive photocatalytic activity,” Li says. 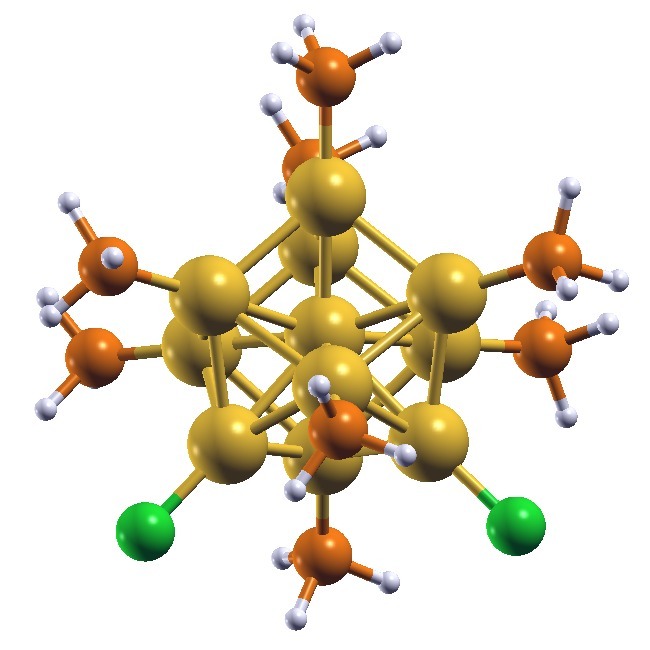 When the Stony Brook researchers seeded the cadmium sulfate with nanoparticles of different sizes and composition, they found gold clusters boosted hydrogen production by as much as 35 times. The gold particles that worked best were about a nanometer in size – each just tens of atoms, as Brookhaven staff scientist Dong Su showed with high-tech transmission electron and scanning transmission electron microscopes. The researchers weren’t sure, however, what precise particle size contributed most to the enhanced effect or how they work. They could only average results from all the sizes on the substrate.